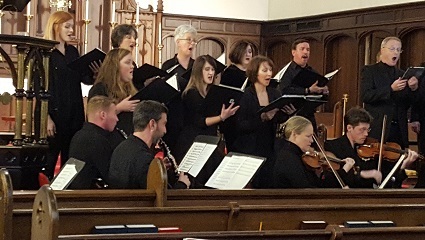 The Chattanooga Bach Choir, David Long artistic director and conductor, presents its 4th annual Barnett & Company Cantata Series, featuring four Sunday afternoon concerts focusing on J.S. Bach’s choral works chosen for the particular Sunday in the liturgical calendar. All concerts take places at 5 p.m. at Christ Church Episcopal, 663 Douglas St. in Chattanooga. Series subscriptions (three concerts) are $45. Single tickets are $20. Students are free. For more information, visit www.chattanoogabachchoir.org. The 2018-19 Barnett & Company Cantata Series continues this Sunday with Bach’s Cantata BWV 38, Aus tiefer Not schrei ich zu dir (Out of deep anguish I call to You), composed for the 21st Sunday after Trinity. Completing the hour-long program are Renaissance master Orlando di Lasso’s a cappella setting of Psalm 39, Dixi custodiam vias meas (I will watch my words), and Bach’s chorale prelude for organ, Aus tiefer Not schrei ich zu dir, BWV 687 from Clavierübung III. Joining the Bach Choir are solo artists Cynthia Johnson, soprano; Sara Snider Schone, mezzo-soprano; James Harr, tenor; Zachary J.
Cavan, bass, and Karla Fowkes, organ. In this Cantata, Bach uses the hymn melody for the opening chorus, weaving intricate vocal lines through counterpoint and imitation to heighten the emotional anguish in the words. In all his vocal writing, Bach treats his singers as instrumentalists, giving them demanding parts. The middle movements for solo voices and instruments offer commentary on the penitential theme alternating between heartfelt expressions of hope and despair. In the final chorus, the hymn returns in an uplifting four-part setting that brings the work to a hopeful, comforting conclusion. Also on the program are a motet setting of Psalm 39 by the Renaissance composer Orlando di Lasso, and Bach’s magnificent chorale prelude for organ based on Luther’s hymn tune heard in the cantata. The Bach Choir offers these musical meditations as a brief respite in our daily lives." The Bach Choir’s Barnett & Company Cantata Series explores J.S. Bach’s more than 200 cantatas written for every Sunday in the church year. David Long introduces each Cantata with a brief musical explanation, placing each work in its liturgical context. The 2018-19 season continues in 2019 on Feb. 17, 2019: BWV 144, Nimm, was dein ist, und gehe hin (3rd Sunday before Lent); and March 31, 2019: BWV 1, Wie schön leuchtet der Morgenstern (Feast of the Annunciation). All concerts take place at Christ Church Episcopal, 663 Douglas St. at 5 p.m.